We will be misreading works of horror as if they were works of philosophy. What if we read Poe or Lovecraft as philosophers rather than as writers of short stories? This means that the typical concerns of the writer or literary critic – plot, character, setting, genre, and so on – will be less relevant to us than the ideas contained in the story – and the central thought that runs through much of supernatural horror is the limit of thought, human characters confronted with the limit of the human. In fact, I would even go so far as to say that what is unique about the horror genre – and particularly supernatural horror – is its indifference to all the accoutrements of human drama. All that remains is the fragmentary and sometimes lyrical testimony of the human being struggling to confront its lack of “sufficient reason” in the vast cosmos. With this in mind, the aim of followed here will be to treat Lovecraft not primarily as the writer of weird fictions but rather to see Lovecraft as a kind of theologian. Whilst accepting that Lovecraft could never convincingly be argued to be a theologically orthodox writer the aim will be to present Lovecraft and his Cthulhu mythos as exploring a kind of theological ontology, one that challenges traditional theological understandings of being, whilst at the same time highlighting new possibilities for theological work on the gothic. Through examining the stories that focus most heavily on representations of the Elder Gods, Lovecraft’s interest in the ontological implications of his view on the universe come into sharp focus. Typically, the reaction to encountering a figure of monstrous Otherness generally falls into two patterns, both of which have Scriptural correlates. The monster as the uncanny can be demonized as a threat to the order of God’s creation – Stoker’s Dracula has the quest of battling its villain framed as a holy crusade seeking to restore righteous order to the Empire. This is a clear echo of Biblical language on the nature of creation as can be seen in the response to Leviathan in Psalm 74 and Isiah 27. By demonizing the radical Other, in the figure of the monster, we ensure the continued coherence of God’s orderly creation. The other response is to consider the Other as part of a sacred revelation of the power of the almighty. H.P Lovecraft’s Cthulhu mythos forms it’s monsters into “Elder Gods” whose presence is not simply demonic but rather the in breaking of almost transcendent presence and power to our dimension of existence. The Biblical tradition here comes from the divine speech out from the whirlwind at the conclusion of the book of Job, wherein the powerful figures of Leviathan and Behemoth are seen as tangible examples of the awesome power of God. Strikingly however this relationship between the revelation of the divine from Scripture and the revelation of the Elder Gods or Cthulhu monsters is immediately problematized – there is in Lovecraft’s stories no God to which these figures defer and whilst often in great danger characters (at the least main characters and protagonists) are seldom if ever killed. Rather, to encounter the Elder Gods and the other denizens of the Cthulhu mythos is to encounter the very limit of what is thinkable – which goes some way to perhaps explaining the recent resurgence in philosophical work that utilises Lovecraft. Therefore, to read Lovecraft theologically requires a re-examination of where the horror of the Cthulhu mythos resides. 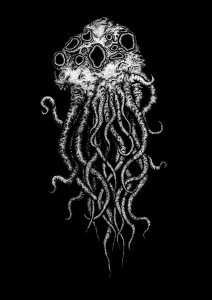 Rather than the fear of death and its accompanying confrontation with an omnipotent deity, the fear that runs through the Cthulhu stories is a fear of life – the horrific encounters that Lovecraft details are never post-mortem but rather uncomfortably alive – encountered in the in media res of existence itself. The encounter with Cthulhu is an experience of a life and a kind of life that the human subject seems simply unable to comprehend or process. Death is, after all only a state of non-existence, which, within Lovecraft’s view at least, has nothing to distinguish it from the non-existence that preceded existence. Philosophically this may not be the most cheering thought, yet as Schopenhauer writes in The World As Will and Representation, ‘the infinity a parte post without me cannot be any more fearful than the infinity a parte ante without me, since the two are not distinguished by anything except the intervention of an ephemeral life dream.’ Seen this way, the theological challenge of Lovecraft’s Cthulhu mythos is in the extent to which those three states, the before life, life and the after-life are revealed to be not temporal stages, but rather dangerously liminal and ambiguously divided levels of existence stripped of the comforting demarcation that daily life affords. This life negation carries with it the possibility of a blasphemous life – a contradiction whereby the states of life and death become almost impossible to tease apart or securely identify. Returning to Dante for a moment, the traitor Capaneus on noticing Dante’s gaze, defiantly ‘roars forth’ that, ‘What I, once living was, so dead I am.’ Whilst it is perfectly possible to see the line as nothing more than a shout of rebellion (a blasphemer against God I was in life, so I am in death) perhaps we might read the line as instead something akin to ‘I am a living contradiction’ – what I was in life, so am I, still after the point of death. This state of contradictory experience is, as Thacker rightly notes, essential for understanding Lovecraft as in his ‘weird biologies’ this contradiction of the life that is not, strives to be elevated to the height of an ontological principle. The discovery of the Shoggoths in the At the Mountains of Madness are a case in point here – after the discovery of the Cyclopean city with its ‘monstrous perversions of geometrical laws’ the explorers discover these creatures which resemble formless yet geometrical patterns. To return to Lovecraft’s quote with which I began, a theological reading of the Cthulhu mythos would seek to argue that just as Lovecraft claimed, nothing matters, very much indeed. And in dealing with Lovecraft’s incarnations of das Nichtige, may that be more than just the restfulness of a scientific convention.